This model is Tacx's most high-performance smart trainer to date. Extremely quiet, it's a powerful device to help your training and uses their latest technology and direct drive system to do this. Just like other Smart trainers, the Neo communicates using ANT+ and Bluetooth Smart, allowing it to be connected quickly and easily with Tacx apps. The trainer automatically communicates in all signals and can, therefore, be easily connected to a tablet, smartphone or GPS computer to have your training data in your line of sight. Using a tablet even makes an interactive training possible, e.g. with training programmes or videos. 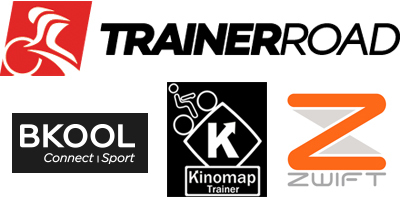 This trainer is compatible with various open third-party software platforms, as well as the free Tacx software, which will help to make your training sessions much more fun and realistic. The direct ride feel is generated thanks to the “real direct drive” concept, with no flywheel, the magic happens with 10,000 communication transfers per second creating real-life inertia just like riding on the road. No high speed running noise and no vibration ensures the Neo is truly the world's quietest trainer. The lack of any physical transmission and in turn any parts that could rattle or rub against each other ensures this trainer is extremely quiet. In addition, this trainer requires no calibration and suffers no wear and tear. Furthermore, the trainer's Plugin/Plug out technology means it can be used with and without a plug. When the plug is not in use, the trainer will act as a wireless motor brake. This means the trainer will not be able to speed up during descents. The Neo represents the ultimate in ease of use. Cassette is not included and the freehub body on this model is for use with a Shimano Cassette. Tacx Neo Direct Drive Smart Trainer is rated 4.4 out of 5 by 89. Rated 5 out of 5 by ali7757 from Awsome piece of technology This was an expensive purchase but after a winter of injury and very little cycling I needed to be doing some intensive training. this has revolutionised my whole program and my mojo is booming. Rated 5 out of 5 by Chris2827 from Quiet, easy to set up, perfect I’m completely new to training, and wanted something quiet so I wouldn’t wake the kids up when I’m pedalling at 6AM. The Tacx Neo is perfect. Expensive, but really high quality and worth it. Rated 5 out of 5 by BGcycler from Very realistic I bought this to replace a Tacx I genius, it was very easy to use and it works really well with the Tacx desktop app. The app is very realistic even giving a sensation when on rough surfaces. The films from Tacx are just like being out on the road but you don’t have to worry about idiot motorists cutting you up and with the recent foul weather you can train in the comfort (if you can it that!) of your own home. Rated 4 out of 5 by Danbo76 from Excellent (once faulty unit replaced). The first version that I ordered made a terrible noise at certain speeds (nobody on online forums could diagnose problem). Wiggle were excellent at offering a replacement trainer. My only criticism of wiggle is that it took 3 weeks for the replacement to arrive after sending the faulty unit back. I am very pleased with my replacement trainer. Have previously owned a kurt kinetic rock n roll and I was impressed by the fact that there is also some side to side flex in this trainer. It makes it very comfortable and smooth to ride. I have just compared the power readings of the Neo to my stages (left side only) power meter during a aTrainer road workout and have been pleasantly surprised that it seems to track to within a couple of watts (during 240W interval). Other things that have impressed me are the solid feel of the unit, the fact that it works when not plugged in and the fact that it is recognised and connects to third party apps really quickly. Also good that the power meter does not require calibration. The description says &quot;Can be used with a PC, but optional with the purchase of their Upgrade Smart kit&quot; What does that mean? My intention would be to use it with a windows 10 computer, having an ANT+ dongle connected via USB and then use TrainerRoad and Zwift to control the Neo and log the results to Strava. Do I have to buy an &quot;upgrade smart kit&quot; in order to use it like that? Hi, yes it is compatible and it does send power data. I recommend to use the 3 second average. You can also adjust resistance from the Edge 1000. That power data does not include l/r balance or any of the other garmin cycling dynamics stats (only vector pedals do those), which is obviously because it is a hub based powermeter. I think the new elite top model can do something like pedal smoothness, but you'd have to look into that. I know it says 10/11 speed but can I fit an 8 speed casssette ? Maybe with a spacer ? With the use of a 1.85mm spacer the trainer can be used with an 8 speed cassette. Hope this helps. What is the diffeance between the 2016 and 2017 models? They have made a slight alteration so it accepts a larger range of bikes, disk and triathlon for example. Is it compatable with a 11-32 cassette, with ultegra Di2 derailuer medium cage? you can use the Tacx Neo with a bike fitted with Di2 and it will be compatible with an 11 - 32 cassette. Is this trainer compatible with the SRAM Force1 long cage derailleur and 11-42 cassettes, please? Yes this will be fine. We hope this helps. Will it work with Di2 gears (I have disc brakes too)? The freehub body (10/11 speed) is universal so you can install a Shimano or Campagnolo cassette. Does the model that you are currently selling have the shimano locking nut? I want to buy the taco neo trainer from wiggle can I also purchase a comparable campaign 10 speed cassette from wiggle? 4 spline centaur or chorus? Will this work with a thru axel bike? This trainer is not thru axle compatible i'm afraid.